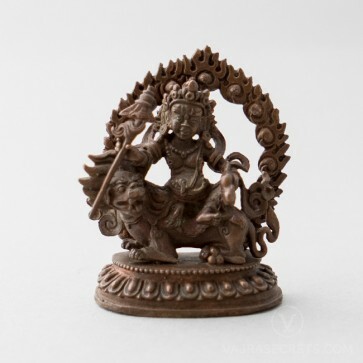 A 2.8-inch hand-carved copper statue of Namtose, an enlightened wealth protector who helps improve one's financial situation and grants strong protection against harmful interferences and negative energies. A perfect addition to a small shrine at home, in the workplace and especially in places of business. 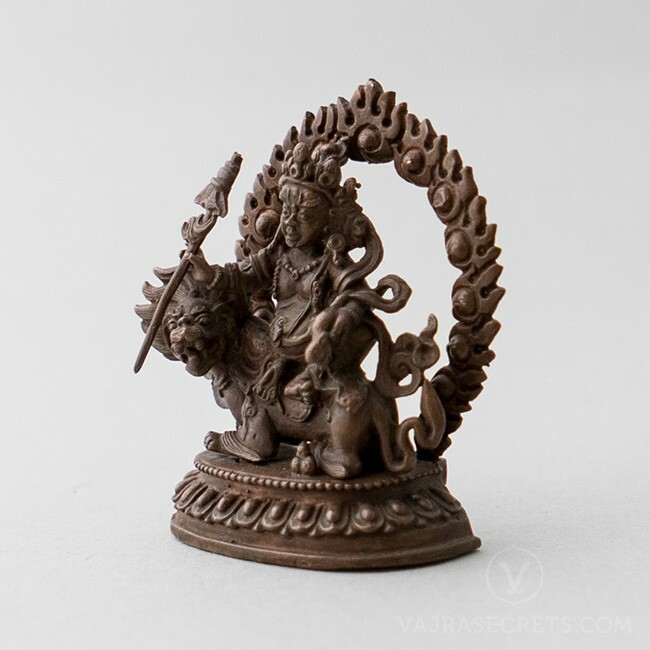 A 2.8-inch oxidised-finish copper statue of Namtose, an enlightened wealth protector and one of the Four Heavenly Kings. Hand-carved by master craftsmen with full iconographic detail according to traditional scriptural sources, this is a perfect addition to a small shrine at home, in the workplace and especially in places of business. Namtose, also known as Vaisravana in Sanskrit and Bishamonten in Japanese, is a Buddha of Wealth and the Guardian of the Northern direction. Namtose has two main aspects: that of a warrior protector and that of a deity of wealth. Although fully enlightened, Namtose chose to manifest as a Bodhisattva with the aim of helping others overcome poverty and misery. He has promised Buddha Shakyamuni to preserve and protect the teachings of the Buddha and guide all its practitioners in future aeons. He has one face, two arms and rides upon a snow lion. His face has a stern expression with bushy eyebrows and a beard, and his eyes are wide and round. His body is a rich golden yellow, his right hand holds a victory banner, and his left holds a mongoose, commonly associated with good fortune in ancient India. 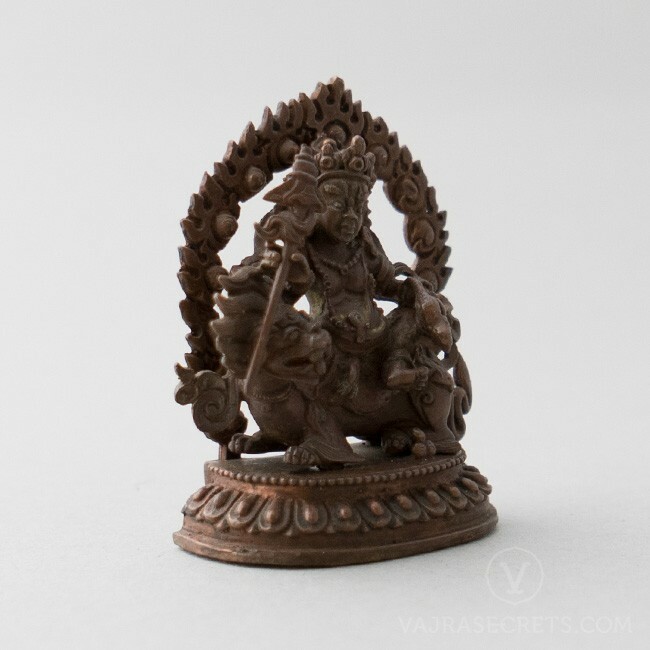 The mongoose spits jewels symbolising his capacity as a wealth deity. Namtose is one of the primary protectors of the Gelugpa sect and one of his specific functions is to protect the Middle Scope of the Lamrim. In his capacity as one of the Four Directional Guardians, Namtose is often depicted on the outer walls of monasteries and temples, to safeguard against harmful interferences. This Namtose statue can be personalised with a hand-painted face using real gold dust or insertion of mantras and holy items. One can also offer brocade, pearls and semi-precious stones, as H.E. Tsem Rinpoche always encourages the practice of making offerings to the Three Jewels, which creates the causes for us to attain the six paramitas (perfections).